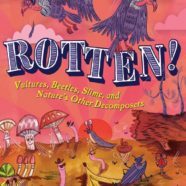 Open this book to uncover the dirty rotten truth about one of nature’s most fascinating processes. ITCH: Everything You Didn’t Want to Know About What Makes You Scratch. Everybody gets itchy, and every kid will love this title that scratches the itch to know more about the history, anatomy, botany, biology behind it. You can feel it coming on—that terrible, tortuous ITCH. It’s your body’s way of sending you a message you can’t miss. And there are so many things that make us itch—from fungus to fleas, mosquitoes to nettles, poison ivy to tarantulas! Combining history, anatomy, laugh-out-loud illustrations, and even tips to avoid—and soothe—the itch, Anita Sanchez takes readers on an intriguing look into what makes you scratch. Illustrations by Gilbert Ford. 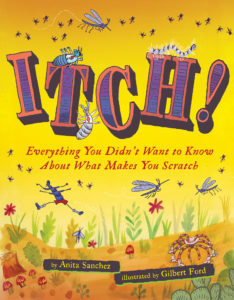 ITCH is a Junior Library Guild selection. It’s night. It’s dark. Time to go indoors—or is it? The outdoors at night can be a scary place. 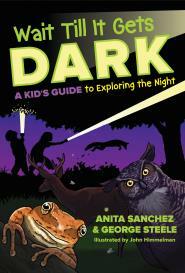 Wait Till It Gets Dark by Anita Sanchez and George Steele will help young readers investigate the mysterious nature of night. Can you walk as silently as a fox? Use your night vision like an owl? Follow a scent trail? Filled with activities and ideas, this book invites readers of all ages to explore the mysterious world of their own backyards after dark. Swine’s snout? Yellow daisy? Dandelion? What was the right name? Young Karl Linné wasn’t sure—and neither was anyone else! Doctors, gardeners, farmers—everybody!—argued about the names of plants and animals. How could scientists communicate if they couldn’t even agree on what to call things? Karl knew there was only one solution: to organize and name EVERY LIVING THING in the world. But it was an enormous job. Could he do it? He decided to try. Karl created a new language of science—and forever changed the way people saw the world. Karl, Get out of the Garden! 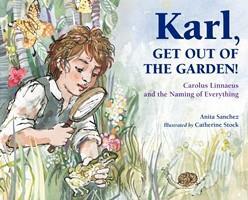 is a picture book biography of Carolus Linnaeus. The famous naturalist was a brilliant scientist whose system of binomial nomenclature–two names for each living thing–is still used today. But he started out as a curious little boy with a passion for weeds and bugs. His exuberant, outspoken, and defiant personality makes him a fascinating character. As a science writer, I’m fascinated by plants and animals that are unloved—like dandelions, tarantulas, and what is perhaps the world’s most hated plant—poison ivy. Millions of people are allergic to poison ivy, which contains one of the most potent toxins on earth. But the astounding paradox is that poison ivy is a plant of immense ecological value. It’s a plant of a powerful plant with a dramatic history and an increasingly important role in the American landscape. For me, poison ivy has served as a lens through which to take a closer look at the green world, and the changes and challenges that face our planet. 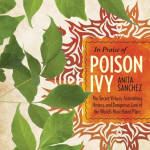 In Praise of Poison Ivy is a nonfiction book for adults, which explores the vices and virtues of a powerful plant with a dramatic history and an increasingly important role in the American landscape. Leaflets Three, Let it Be! : The Story of Poison Ivy is a children’s picture book, designed to help the youngest outdoor explorers both appreciate and avoid poison ivy. 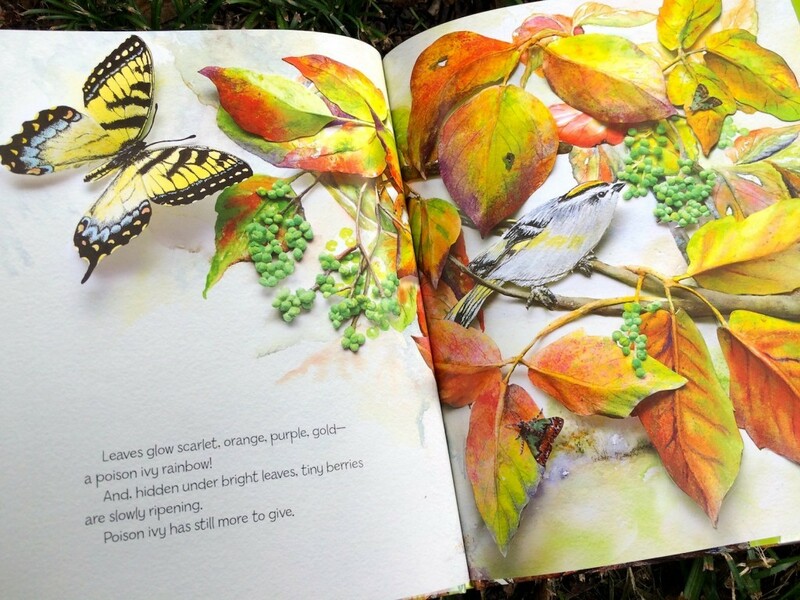 Beautiful illustrations by Robin Brickman highlight the amazing variety of wildlife that use poison ivy for food and shelter. And no, they don’t get itchy–only humans are affected by the toxic three leaves. Bees buzz in poison ivy flowers, gathering poison ivy nectar. Cardinals use poison ivy rootlets to line their nests. Insects roll themselves up in a snug blanket of poison ivy leaves while toads hunt and spiders spin webs in the shade. And birds by the dozens come flocking to a poison ivy feast of winter berries. 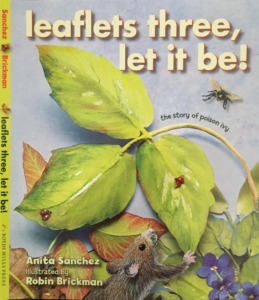 Anita’s other published books include Mr. Lincoln’s Chair: The Shakers and Their Quest for Peace, The Invasion of Sandy Bay, and The Teeth of the Lion: The Story of the Beloved and Despised Dandelion. Her first book was The Teeth of the Lion: The Story of the Beloved and Despised Dandelion, published by McDonald and Woodward Publishing Company. 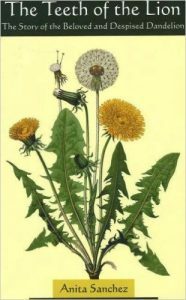 The book is packed with information about–of all things!– dandelions. It describes their ecology, and the crucial and unexpected role they play in the environment. The despised little lawn weed has been used by humans for centuries as a powerful medicine. The final chapters describe the environmental damage caused by the indiscriminate use of lawn pesticides. The book tells the tale–a true story–of how British and American soldiers worked together to free prisoners and create a truce in the midst of violence. 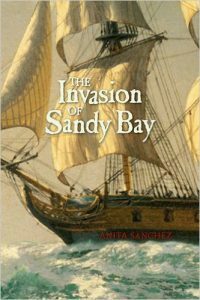 The Boston Authors’ Club described Sandy Bay as “the antithesis to war stories,” and selected it for their List of Highly Recommended Books.